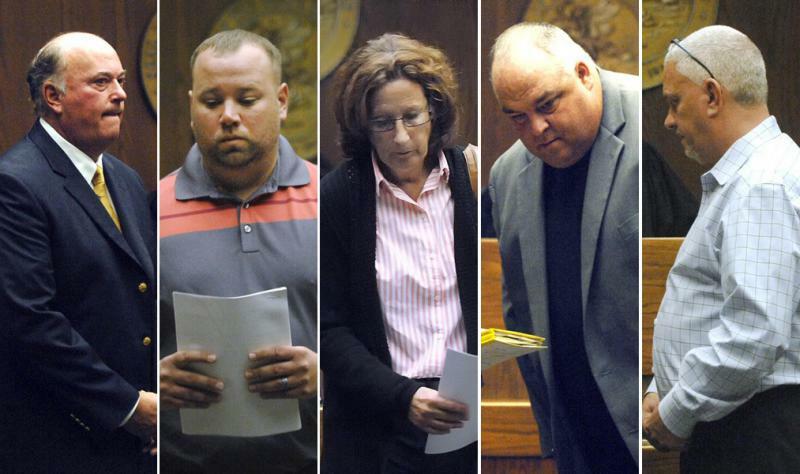 Coliseum defendants, from left, John Butler, Jay Laesch, Kelly Klein, Bart Rogers, and Paul Grazar during their arraignment Sept. 29, 2017. Yet it wasn’t just a murky contract that opened the door to the possibility of fraud. GLT interviews with past and present city officials reveal a lack of scrutiny by Bloomington leaders—even as others raised concerns about alleged food-and-beverage skimming that’s now at the heart of the criminal investigation. 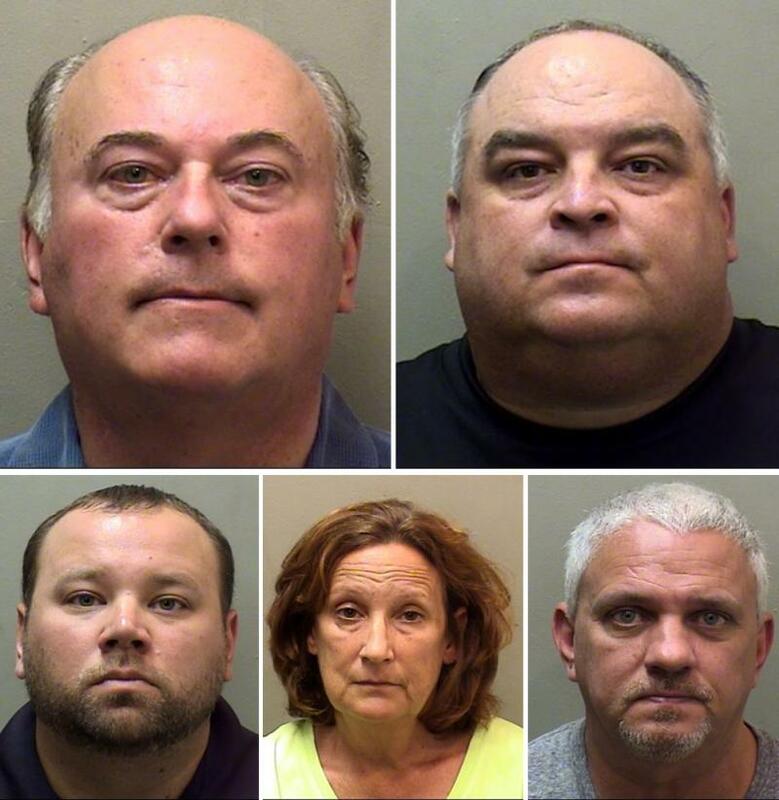 Five former managers at the Coliseum (now called Grossinger Motors Arena) have pleaded not guilty to 111 counts of theft, fraud, money laundering and other charges. They’re accused of an elaborate scheme that skimmed off concession fees, over-billed for cleaning supplies, and disguised other charges. Exact figures are not known; the charges indicate theft of around $1 million. "I knew there would be no transparency. And sure enough, there wasn't." 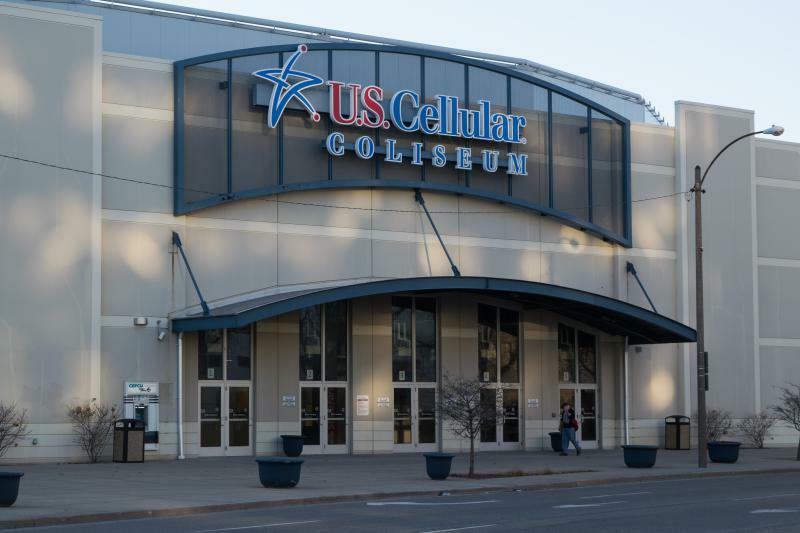 Facing the bulk of the charges is John Butler, owner of Central Illinois Arena Management (CIAM), which ran the Coliseum from 2006-2016, and its in-house food-and-beverage company, BMI Concessions. The other four defendants worked for CIAM and BMI. The indictments capped a 16-month Illinois State Police investigation that began in 2016 after the new Coliseum managers, VenuWorks, noticed alleged financial “discrepancies” and alerted the city. Former Bloomington Mayor Steve Stockton, who served two terms from 2005-2013, said he was “disappointed” to hear about the charges, though he cautioned that the defendants were innocent until proven guilty. He inherited the Coliseum from his predecessor, former Mayor Judy Markowitz, but “my mission was to make it work,” said Stockton. “It might have done better if there was an additional $1.1 million coming into the city,” he said, referring to the apparent amount of theft tied to the investigation. Many of the criminal charges relate to BMI, the food-and-beverage company. Prosecutors say BMI was illegally keeping tens of thousands of dollars in commissions owed to the city as profit. The defendants were allegedly doing this using what they called the “Kelly Discount,” an apparent reference to Kelly Klein, the Coliseum’s now-indicted former assistant general manager for finance. If true, a scheme like this might be difficult for the city to uncover. GLT has learned the city did not perform annual audits on BMI Concessions as it did with the Coliseum itself. City officials told GLT that they had limited visibility into granular food-and-beverage sales figures. Former Bloomington Alderman Mike Matejka. Hamilton told him yes, Matejka said. But when the venue’s first quarterly report was released, that granular data was not included. Matejka was told it was proprietary and would not be shared. A message left with Hamilton was not returned. In response to questions from GLT this week, the City of Bloomington issued a brief statement. “We are aware there are many questions about the criminal charges related to the arena. In time, we believe all of these questions will be answered and addressed. Until that time, we ask for the continued patience of the public,” the statement read. Examples of those "affirmative steps" include the city now having access to the arena's QuickBooks, as well as having a contract administrator on staff to spearhead contract compliance, city spokesperson Nora Dukowitz said Wednesday. The food-and-beverage commissions were at the core of a lawsuit filed in 2014 by McLean County blogger Diane Benjamin, whose reporting alleged some of the same crimes laid out in the criminal case. Benjamin sought detailed financial records and salary information from the Coliseum. CIAM’s lawyer, Bill Mueller, told the city in a January 2015 letter that CIAM shouldn’t have to release those records. He said that doing so would hurt CIAM’s ability to book future acts, because performers don’t want the financial success or failure of a show to become public. “Event contracts usually embody some of the protocols, customs, and practices of the industry, but virtually all of them require that specific financial data regarding the show remain confidential,” Mueller wrote. “Detailed financial information” such as concession revenue is considered “confidential, and proprietary information,” Mueller wrote in a letter to Bloomington city attorney Jeff Jurgens. Butler and then-business partner, Mike Nelson, created BMI Concessions in October 2005, a few days after CIAM’s contract was approved by the Bloomington City Council. The idea of running an in-house food and beverage company—in addition to general management duties at the arena—was spearheaded by Butler, according to a former arena official who requested anonymity. "From the very beginning, it was not a good agreement." That relationship between CIAM and BMI concerned some city officials, although it’s something that other publicly owned arenas have done. The BMO Harris Bank Center in Rockford, for example, is managed by SMG. Its food-and-beverage company is SAVOR, a subsidiary of SMG. Former Alderman Stearns had concerns about the lack of transparency that such an arrangement might create. “I knew there would be no transparency. And sure enough, there wasn’t,” Stearns said. Food and beverage is by its nature difficult to watch closely, said Stockton. “There were hundreds of people involved in the food and beverage operation. We had community groups that were out there manning the concessions to (fund-raise). There’s a lot of cash flowing through there, and I guess it is a perfect opportunity to say, ‘Well, if we just take a little off the top,’ as apparently what’s alleged here," Stockton said. “In retrospect, I can see where that’s an easier opportunity (to steal) than, for example, ticket sales where you actually have a set number of tickets. They don’t number hamburgers,” Stockton added. 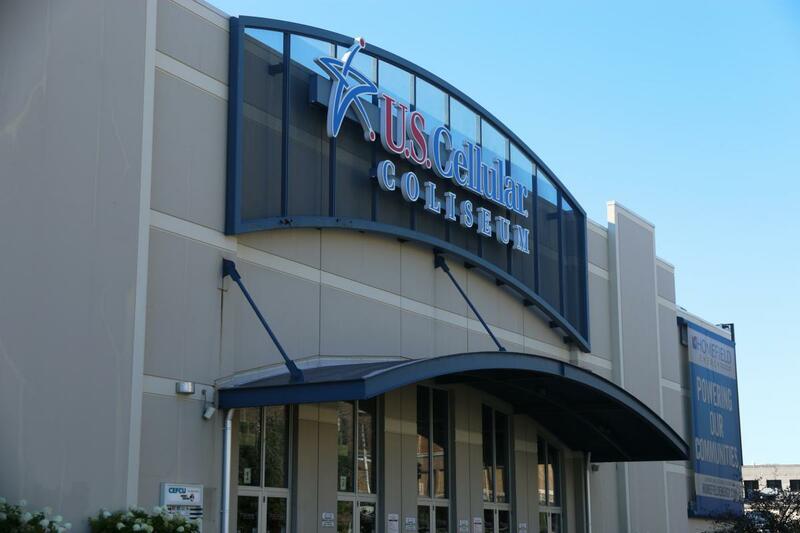 The city’s 10-year management contract with CIAM had a tumultuous beginning, as did the Coliseum itself. In an advisory referendum in 2005, 66 percent of voters said they opposed using public money for the arena, but that’s what happened anyway. Those critics have maintained their opposition in the years since, with many who still wish it never had been built. Butler and Nelson, the CIAM owners, were awarded that final management contract in October 2005. The Bloomington City Council initially approved a management contract with a different company called Bloomington Partners, which included Butler and Nelson and other partners. 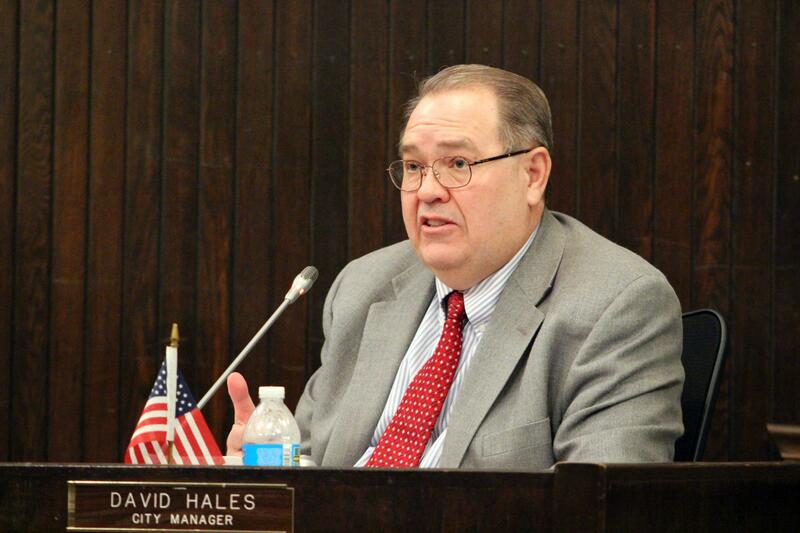 Bloomington City Manager David Hales is leaving for a new job in Joliet next month. City officials have had qualms with the CIAM contract for years. CIAM and the city parted ways in March 2016, as city leaders pushed for more financial protections in any contract renewal. VenuWorks was then hired and continues to run the Coliseum today. 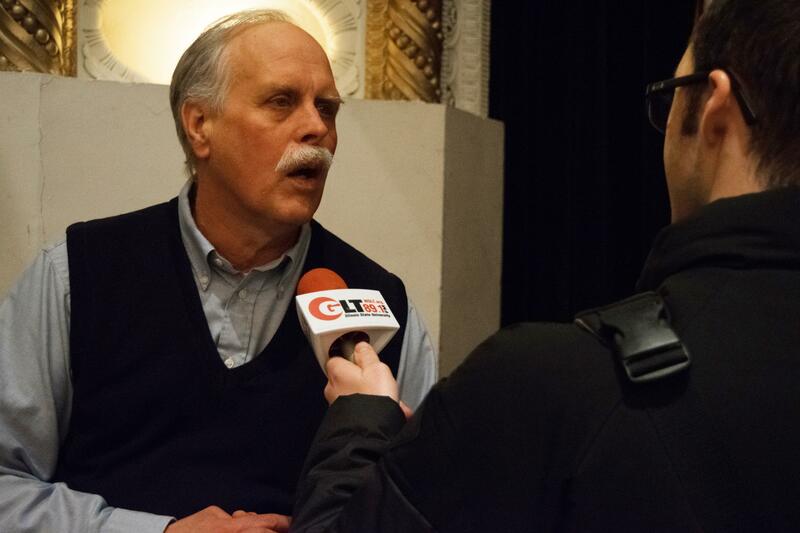 The original CIAM contract was a “very, very poor” contract that put too much risk on Bloomington and not enough on CIAM, said former Alderman Skip Crawford, a vocal Coliseum opponent who served on the Bloomington City Council from 1997-2007. “That is what I see coming back to bite us,” Crawford told GLT. If the contract seemed to favor a private management company, one reason may be because that’s who wrote it. An attorney for Bloomington Partners drafted the initial contract, which was reviewed by a Bloomington city attorney and two outside lawyers representing the city, GLT has learned. The contract’s 10-year term was a sticking point for city officials. 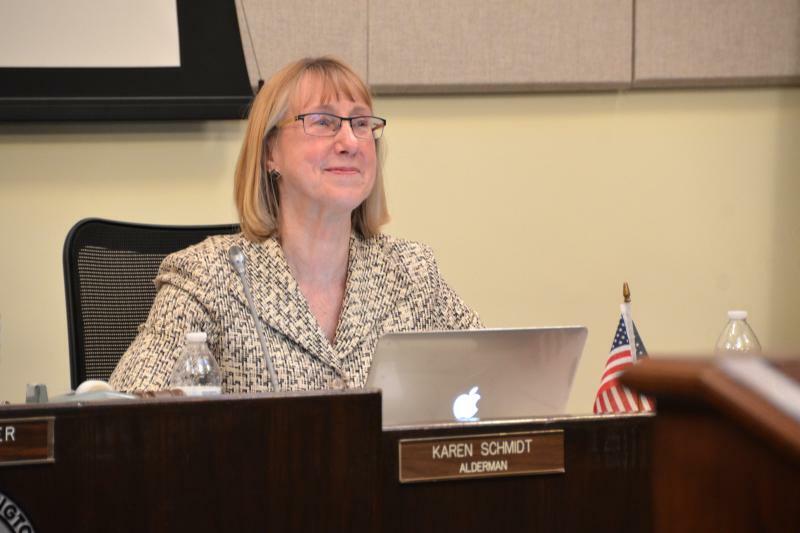 Bloomington unsuccessfully sought a five-year initial term with two five-year renewals, sources told GLT. Other publicly owned arenas have opted for shorter terms. The Sears Centre Arena, owned by Hoffman Estates, began with a two-year contract with its management company, later extending by two, three, and five years, records show. SMG is currently on a five-year contract with BMO Harris Bank Center in Rockford. Bloomington’s new VenuWorks contract is for five years. In April 2014, then-Alderman Kevin Lower and Stearns wanted the city to renegotiate its contract with CIAM, using as leverage its desire to change from a professional to a junior hockey team as an anchor tenant. City administration responded by saying a council work session would be held to discuss contract issues; Stearns said that follow-up session never took place. “I’d like to bring the whole thing up at once and get this clarified very, very soon,” Lower said. Stockton said the council wasn’t monitoring closely the food and beverage receipts from each event. That’s more the responsibility of CIAM, the city’s Finance Department, or city manager, he said. “I’m not sure that I, or the other members of the city council, would be very good judges of, you know, ‘This looks right, this looks wrong,’” said Stockton. Stearns said that Hales and Mayor Tari Renner did not take her concerns seriously. Instead, aldermen were encouraged to be “cheerleaders” for the Coliseum as operating losses fueled critics, Stearns said. The arena posted operating losses in four of the past five years. Its larger-than-expected operating loss in 2016 was $673,518. It lost $494,230 in 2015. It was the city’s position that “it was council’s role to be excited, to praise the Coliseum, and not to question,” Stearns said. The former alderman also criticized city officials for not taking seriously the allegations being raised by Benjamin on her blog. “There were consequences, and they were serious ones,” Stearns said. Renner declined to comment Wednesday, citing the criminal case. In past media interviews, Renner raised concerns about CIAM and the need for better checks and balances. "We had to insist on terms that better protected the city and taxpayers," Renner said in March 2016, as the city and CIAM failed to reach an agreement on a contract renewal. Some may have assumed it was the job of Bloomington’s external auditors—not its city manager or aldermen—to stop fraud. The Coliseum was audited every year, most recently by the accounting firm Sikich. In 2015, Sikich did not find any problems with the Coliseum’s financial reporting. The Coliseum’s managers were cited in 2014 for an “inadequate system of controls over the preparation of financial statements” caused by a lack of oversight by management. That problem could have lead to “potential material misstatement” of financial statements. That was apparently fixed by 2015. “Sikich has and intends to continue to fully cooperate with law enforcement and the City of Bloomington regarding the criminal investigation and the pursuit of justice as it relates to alleged criminal acts during periods we were retained by the City to provide audit services," Sikich told GLT. The former Coliseum is now called Grossinger Motors Arena. In addition to the annual audits, the city also brought in specialized internal auditors, the Bronner Group, in 2015 to help review various Coliseum accounting and operational issues. “The public needs to know the city is the one who hires those external auditors,” Beckett, Butler’s lawyer, told The Pantagraph. “My client and Central Illinois Arena Management rely on those audits as well." The public generally misunderstands what an external auditor does for a municipality, said Ed Seipp, an instructional assistant professor in the Department of Accounting at Illinois State University. Seipp is an expert in financial reporting fraud and is a certified internal auditor. That misconception has a name—the “expectancy gap.” An external auditor’s job is usually just to confirm that a government’s financial statements are reasonably accurate. They may run some tests to see if internal controls are in place, but the goal is not to find fraud, Seipp said. The most notable case of municipal fraud in Illinois happened in Dixon, where the city’s treasurer stole $54 million over 22 years without detection. The city of Dixon eventually sued its auditors and bank and settled for $40 million—with the auditors paying the bulk of it. That’s rare, but it has happened, Seipp said. Bloomington city officials declined to comment Wednesday on whether litigation against Sikich is being considered in the Coliseum case. “The depth of the accusations is actually pretty alarming when you think about the good-faith efforts that was made to build a community center,” he said.